The MD60 Series mechanical hanging scale is designed expressly for dairy applications. 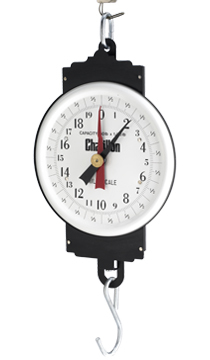 The scale is constructed of heavy gauge japanned steel with large, easy-to-read 8-inch dial, that has large, bold black numbers and graduations. The MD60 scale has two pointers - one pointer can be locked to indicate net tare weight; the other pointer indicates gross weight. The scale capacity is achieved in 3 pointer revolutions. Scale capacity is 60 lbs. Measurements are in 1/10 lb increments. Scales feature a convenient zero adjustment screw. Scale is factory calibrated using certified NIST weights, and comes with top loop and bottom hook which both are plated.